The above pages provide reference material, rationale and background for the designs described on this page. As it turns out, many types of LEDs appear to exhibit gain effects akin to those of an avalanche photo diode when reverse-biased - an effect that has been observed in the 25-300 volt area with the voltage, spectral response, and overall sensitivity/gain depending on the LED's construction and material. It is possible to adapt some of the circuits on this page to be used with an LED for experimentation of this gain mechanism. Not surprisingly, the degree to which this effect occurs and at what voltage tends to vary wildly from device to device as this is not a mode in which LEDs were intended to operate! The stability and long-term viability of operating an LED this way is another factor that should be considered. While the results do vary, some LEDs have been noted to offer reasonable performance as gain-enhanced detectors when operated in this mode making it practical to have at least moderate performance as a detector - a particular attraction if one wants to build an optical transceiver that uses just one diode for both receive and transmit. While an interesting phenomenon, tests thusfar seem to indicate that, at least for baseband (audio) use, the ultimate sensitivity of a typical LED operated in this mode is worse than that of a well-designed optical detector using standard PIN photodiodes. Having said this, this avalanche effect can be used to good effect to make an optical transceiver that uses the LED for both transmitting and detection and yield a single, compact package with reasonable performance. I've not seen "ultimate sensitivity" comparisons with PIN photodiode-based receivers and avalanche LED receivers for subcarrier (ultrasonic and up) operation. The circuits described on this page can form the basis of an optical receiver utilizing the avalanche effects. If higher bandwidth is desired (with an acceptance of poorer weak-signal sensitivity) then a typical transimpedance amplifier circuit may be employed with either a "real" APD or a reverse-biased LED. An article describing the use of the avalanche gain effect exhibited by LEDs may be found at the bottom of this page in the article "Optical Receiver Operation With High Internal Gain of GaP and GaAsP/GaP Light-emitting diodes" linked at the bottom of this page. The Avalanche Photo Diode (APD) is, as its name implies, a diode that electrically responds to light that impinges on its active surface using the photoelectric effect, converting varying amounts of light to correspondingly varying electrical current. "Normal" photodiodes also do this, but have no "gain" in doing so - that is, it takes the action of more than a single photon to cause the movement of a single electron. As one might imagine, at very low light level - where there are relatively few photons - the currents produced by a standard photodiode can be very small indeed! APDs have intrinsic to them the ability to effectively amplify the signal due to the fact that one "event" can loose a barrage (or "avalanche") of electrons, the number being related to the gain of the APD itself which is also related to the voltage applied to the APD. The tiny currents produced at very low light levels have to compete with currents (noise) from other sources such as the thermal noise from the circuits attached to it, noise contribution by components in that circuitry and other noise sources related to the diode and transistors themselves. As one can imagine, at these very low light levels these other noise sources could easily dilute or drown out the desired signal! The APD helps combat the problem of these noise sources by having its own internal amplification mechanism meaning that, on average, a single photon can cause the movement of many electrons and by having this additional amplification, the signal coming out of the APD can be high enough to overcome much of the noise of the following components and amplifier stages. As with any circuit, the APD does contribute some of its own noise - particularly when it is run "hotter" (e.g. higher voltage and gain) - and this excess gain can, in fact, reduce overall sensitivity when the device's own noise starts to drown out the desired signal. Because of this intrinsic amplification APDs are often used in very high-speed optical detectors such as those used in fiber optic receivers by allowing (comparatively) insensitive, fast circuits to be used for amplification. One of the difficulties associated with the receiver design has to do with the fact that in order to be used with inexpensive Fresnel lenses, the active area of the photodiode needs to be fairly large - on the order of 1mm diameter or larger - in order to accommodate the imperfect optics of these molded lenses: Much smaller than this, efficiency is lost as the "blur circle" from the lens would be larger than the active area and some of the light from the distant source would be lost. While it is possible that a conventional glass or plastic "secondary" lens could be employed to further-reduce the effective size of the blur circle, the added complexity and need for precision starts to push the construction of such an optical system outside the realm of the amateur experimenter! With any photodiode comes device capacitance and taking the BPW34 - a somewhat large-ish photodiode, when reverse-biased with 10 volts its intrinsic capacitance is on the order of 20 pF. 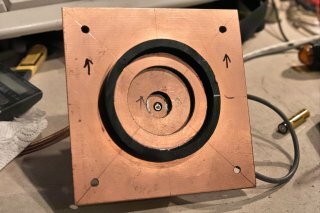 This may not sound like much at audio frequencies but when one considers that the operating impedance may be on the order of 10 Megohms, this correlates with a -3dB rolloff of around 800 Hz - and this doesn't take into account the capacitance of the attached amplifier or stray circuit capacitance! It is, at least in part, this capacitance that further attenuates the weak, higher-frequency AC currents emerging from the photodiode. For our application, we don't need the high speed for which an APD may be capable, but rather its innate amplification capability. In the "Highly-Sensitive speech bandwidth receiver" noted in the link above, the ultimate limit of the sensitivity at mid speech frequencies (200-2500 Hz) was not as much an attribute of the photodiode itself, but due to the "noise floor" of the following amplifier stages and because of practical considerations and the laws of physics, the sensitivity could not be significantly improved without drastic measures such as cooling - something that would greatly complicate the design and implementation. With the intrinsic amplification of an APD we can boost the photon-induced signal to a level that may be sufficiently far above the noise of the amplifying circuit to allow even weaker signals to be detected and to do this, we need a source of bias voltage to drive the multiplication effect within the APD itself. At very low voltages the APD acts just as a "normal" PIN photodiode would, but with increasing voltage an impinging photon will be likely to loose an ever greater number of electronics, effectively providing gain. At still-higher bias voltage the gain continues to go up, but the noise of the device increases faster than the gain and there is a point at which one starts to lose actual sensitivity - even though the gain is still increasing! Top: Schematic of the APD high voltage bias supply. Bottom: The as-built power supply in the enclosure. This receiver uses a AD1100-8-TO52-S1 by First Sensor (formerly Pacific Silicon Sensor) an APD with a 1 mm2 active area (circular, 1.128mm diameter) - a size that is a reasonable match for the "blur circle" of good quality, molded Fresnel lenses. This device is, unfortunately, rather expensive at approximately $150 US each (in 2009, listing closer to $210 each in 2015!) but when it is considered that we spent at least this much on food and fuel whenever we mounted a major expedition to do some optical testing, the device's cost can be put into perspective! This device has a typical maximum bias voltage rating in the 130-150 volt region (for maximum gain) so a regulated, variable, low-current, high-voltage power supply was required. In addition to the bias supply, an amplifier was needed to take the output of the APD and amplify it to a level that was useful to us. As it turns out, these devices were from the same manufacturing lot and included individual data sheets indicating that the maximum gain occurred at 134 volts at 25C. 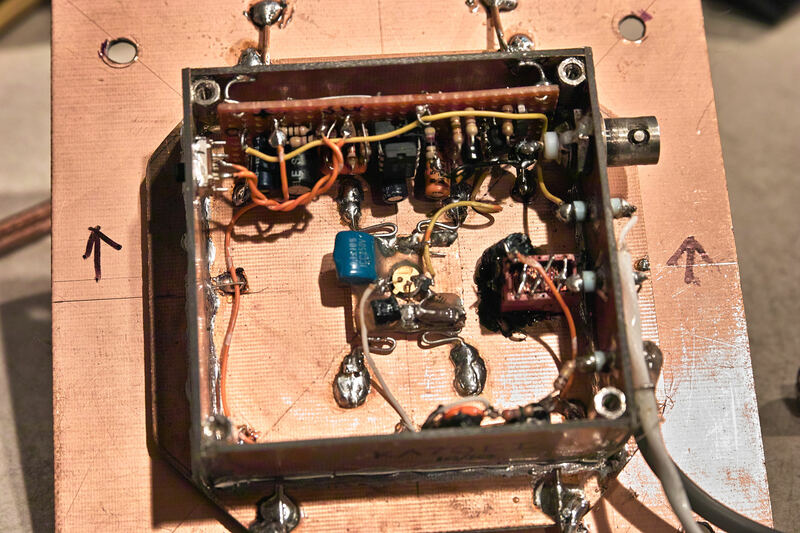 Fortunately, only a few 10's of microamps are required to adequately bias the APD so a very simple boost-type switching supply was devised, seen in Figure 1. Op amp section U101a forms a simple 6.5 kHz oscillator which drives the high voltage transistor Q101 which, in turn, generates a high voltage every time it turns off due to the magnetic field collapse of L101. The output from the collector of Q101 is then rectified by D101 and filtered by C102 - and then filtered some more by C103 in conjunction with R106 - to produce a fairly clean source of high voltage. The 6.5 kHz switching frequency was chosen by experiment: The frequency of the oscillator was varied by substituting different capacitance values at C101 and the output voltage and conversion efficiency was noted and for the particular choke (L101) used, the best results happened to be obtained at 6.5 kHz. Practically speaking, a choke in the range of 4.7 to 33 mH could be used, but the individual characteristics (DC resistance, self-capacitance, etc.) will affect its efficacy in an application such as this. A sample of the high voltage is taken from R108 and R109 and sent to the other section of the op amp where a comparison with an on-board 5 volt supply (from U102) is made. If the voltage is too high, transistor Q102 is turned on, pinching off the drive to the boost transistor, Q102, thereby regulating the output. Without the regulator circuit it was observed that the high voltage could soar to well over 275 volts - a potential above the ratings of C103 which was probably starting to exhibit leakage currents that ultimately limited the voltage! R109 is used to adjust the "maximum" voltage when R111's wiper is set at +5V and this should be adjusted to be about that of the maximum ratings of the APD. Comment: I grounded both ends of R109 only because it was convenient to do so during construction. If I wanted to have a lower "maximum" voltage I would have only grounded one end of the 500k pot. Because a "standard" dual op amp was used, LED101, a standard "non-high brightness" red LED was placed in series with the base drive of Q101 as without it, the op amp's output voltage may not go close enough to ground to fully turn Q101 off. Rather than use a more expensive rail-to-rail op amp or just a couple of ordinary diodes to drop the voltage, the LED was used to insert a 1.5-1.8 volt drop and provide a "free" power-on indicator and, since it is modulated with the 6.5 kHz tone, it can also be used to quickly test the receiver for proper operation simply by exposing the photodiode to its glow and listening for the tone. One of the properties of APDs is that as the bias voltage approaches the maximum ratings of the diode, the gain will start to increase exponentially and in the case of this circuit, that would mean that over the majority of the rotation of the voltage-adjust potentiometer, R111, there would be very little effect. 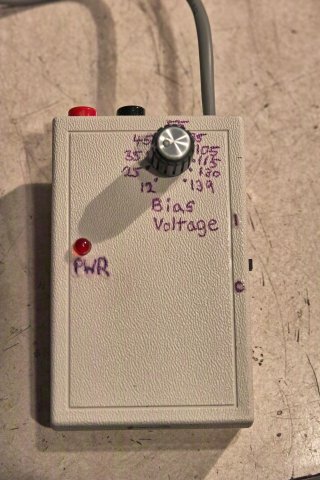 Near the top, however, most of the increase in gain would occur over a vary small portion of the potentiometer's rotation, "crowding" in at the high voltage end and make fine adjustments very touchy. In lieu of a logarithmic taper potentiometer - which can be difficult to find - resistor R112 was placed across the potentiometer to help "stretch" out the adjustments at the top end. Another method of providing more fine adjustment capability would be to add just another potentiometer that, when the "main" pot was turned all of the way up, could provide reasonable "tweaking" room. P101 and P102 are pin-type test jacks that allow the connection of the probes of a high-impedance voltmeter to measure the precise bias voltage and because the contacts are recessed, there is no significant shock hazard when nothing is plugged into them. TH101, a self-resetting 300 mA thermal fuse and D103 are used to protect the device from accidental polarity reversal that might occur when connecting the battery - something that it is easy to do when fumbling around in the dark! R118 and C107 are included to provide a somewhat filtered source of battery voltage to the remotely-mounted optical front end. It should be noted that in many applications an APD is run very close to its maximum gain - which is also very close to the maximum rated voltage. This bias supply was set, using R109, to be capable of producing a few volts higher than the maximum voltage rating of the APD, but because it is current-limited by R202 (see below) no harm is going to come to the diode: Exceeding the maximum voltage causes a tremendous increase in gain and, especially, noise, so this mode of operation isn't very useful. "Fancy" APD bias circuits have provisions to track the temperature of the APD and automatically adjust the applied voltage to compensate for the APD's gain-voltage characteristics to thermally drift but because we really don't need to operate the APD at maximum gain, that was not done here and I could have just as easily set R109 for a much lower "maximum" voltage. Figure 2 shows the optical front end. If you really did read the articles linked at the top of the page, you'll recognize this circuit as an adaptation of the Version 3 (a.k.a. "V3") receiver described on web page, A Highly-Sensitive receiver optimized for speech bandwidth noted above. The obvious difference is the use of an Avalanche Photo Diode instead of the standard PIN photodiode which, as in the case of the V3 receiver circuit, has it's "hot" end (cathode) connected directly to the gate of Q201, a BF862 JFET. As with the V3 design, this looks - at first glance - to be a floating FET gate (a "no no" in circuit design) but it is worth remembering that as is the case with bipolar transistors, there is an intrinsic diode across the gate-source junction, therefore that voltage never exceeds approximately 0.6 volts, and since the "cold" (anode) side of the photodiode is at a higher positive potential, the FET's gate bias is always present - see the inset, below, for further discussion of this mode of JFET operation. Bottom: The as-built optical detector electronics. In the center, you will notice a smaller board that contains the JFET, APD and a few other components. In the case of the D201, the APD, it so-happens that instead of just 7-10 volts of reverse bias as would typically be the case for the PIN photodiode version of the V3 receiver, there could be well over 100 volts - the maximum depending on the characteristics of the APD itself. Under "dark" conditions the leakage currents of the photodiode will be on the order of nanoamps or 10's of nanoamps, increasing in proportion to the luminous flux impinging its surface. If exposed to a lot of light the photodiode will conduct more heavily, but the current-limiting afforded by R202 will protect both the APD and the FET and the bias voltage will necessarily decrease. Just to be sure, I did some testing of the APD receiver in total darkness with a very dim, modulated LED as a weak signal source where I set off a xenon photoflash unit only inches away from the APD: No damage or change in sensitivity was noted indicating that both the APD and JFET were more than capable of handling the worst-case scenario - a brief impulse that would dump the charges of C202/C203 through the APD and into the FET! On the drain of Q201 is bipolar transistor Q203, the two forming a cascode circuit. Because of the very nature of the cascode circuit, the voltage change at the junction of Q201's drain and Q203's emitter is very small with the detected modulations of light being largely that of current, instead. It is with these variations in current - rather than voltage - that the cascode circuit shines as this greatly reduces the Miller Effect - that is, the tendency of the gate-drain capacitance to be multiplied by the voltage gain of the circuit, something that would adversely impact frequency response. This particular cascode has been modified in that it's self-biasing at DC, but it response to AC signals by virtue of C205 and R207/R208 allowing it to auto-adapt to voltage changes. Another departure from the standard cascode circuit is the use of a bipolar current source in the form of Q202, diodes D202 and D203 and resistors R204 and R205. This circuit establishes the majority of Q201's drain current thus allowing a larger proportion of the remainder to be "seen" by the cascode transistor Q203. Doing this has the advantage of increasing the FET's drain current - which will reduce its noise contribution - but unlike a low ohmic-value resistor that might be used to establish the same amount of current, the impedance of the Q202 current source is quite high, typically in the 10's of k-ohms for this type of circuit. It is worth noting that both Q202 and Q203 should be "high-Beta", low noise transistors for optimal performance. Q202, the PNP current source uses a 2N5087 or BC560C transistor but this circuit could be re-worked to use an NPN as depicted in the "Version 3" receiver described here. Q203 is nominally an MPSA18 transistor, but a 2N5089 or BC550C could be used instead. On the collector of Q203 is attached an op amp wired as a unity-gain follower. One section of an LM833 dual low-noise op amp (U201b) is used and it provides a low-impedance buffer for the comparatively high impedance signal found at Q203s collector, effectively isolating it from the load. Following the unity-gain buffer is a simple differentiator stage consisting of U201a, C207 and R209 that counteracts the frequency rolloff caused by the photodiode's capacitance, flattening the frequency response in a manner appropriate for baseband operation with a gradual rolloff above about 6 kHz to minimize "ear fatigue" to the lightener. On this circuit there is also a high/low gain switch (SW201) that, when opened, increases the differentiator's gain by approximately 20dB. The feedback resistors and capacitors (C208/R210 and C209/R211) form additional low-pass elements and set the gain that, in conjunction with the values of C207 and R209, cause the high frequency to be rolled off above 6 kHz: Clearly, the U201a circuit is intended for baseband operation! It should be noted that a sample of the output of U201b, the unity gain buffer, is made available as a "flat" frequency response output. While not truly "flat" owing to the capacitance of the photodiode, this output is intended to be used for those applications where frequency response outside the normal speech band is required, such as very low (<200 Hz) narrowband signalling or high frequency (>6 kHz) systems involving subcarriers. In the case of the latter, the -6dB/octave slope of the photodiode's output at higher frequencies is not particularly problematic when fairly narrow band (<10%) signals - such as an SSB signal at 25 kHz - are involved as the amplitude slope across such a narrow frequency range is not likely to cause any problems. In testing, it was found that at relatively high APD gain and voltage settings that there was usable output in the 1-2 MHz area from the "flat" output: Because of the circuit configuration and the high APD gain involved the sensitivity at these frequencies was not particularly good, but the observation was interesting nonetheless! Because of the extreme sensitivity of the receiver it is necessary to make sure that as much of the 6.5 kHz energy from the bias voltage generator is removed from both power supply leads as possible. On the high voltage lead, R201 and C201 are placed right at the point where the bias voltage enters the enclosure and final filtering and current limiting (to protect the APD) is provided by R202 and C202. Because a slight amount of 6.5 kHz energy also appears on the battery line, L201, a 100 millihenry choke, and C211 provide additional filtering along with R215 and C212. As can be seen from the diagram and picture in Figure 2, the APD, C203, the input JFET Q201, R203 and C204 are mounted on a small board by themselves. This board is connected to the main enclosure - which is constructed from glass-epoxy circuit board material - using short, bent pieces of #18 AWG wire. Not only does this provide a ground return, but it allows the precise adjustment of both focus and paraxial alignment of the APD when mounted in the optical assembly: The wire allows movement along all three axes, but it also holds it in place once adjustments are complete. A short length of small gauge wire gently twisted with another wire connected to the ground make the connection to the emitters of Q202 and Q203 on the main amplifier board. Because of the cascode nature of the circuit, the small amount of capacitance added by this wire does not appreciably affect performance in the frequency range of interest. "No, the gate isn't floating!" At first glance of Figure 2 it may appear that the JFET's gate is floating: IT IS NOT! Note that the "cold end" (non-gate side) of the photodiode may be biased to a rather high voltage and were the FET of an insulated gate type the potential would try to rise to roughly match it - at least until it broke down! Since it is a junction FET, the "gate-drain diode" junction will conduct and keep the "hot end" of the photodiode to within about a "diode's drop" of the drain voltage which - for most practical purposes - is at drain (ground) potential. This allows a bias to be established across the APD, both reducing its capacitance and allowing its internal amplification properties to be realized. 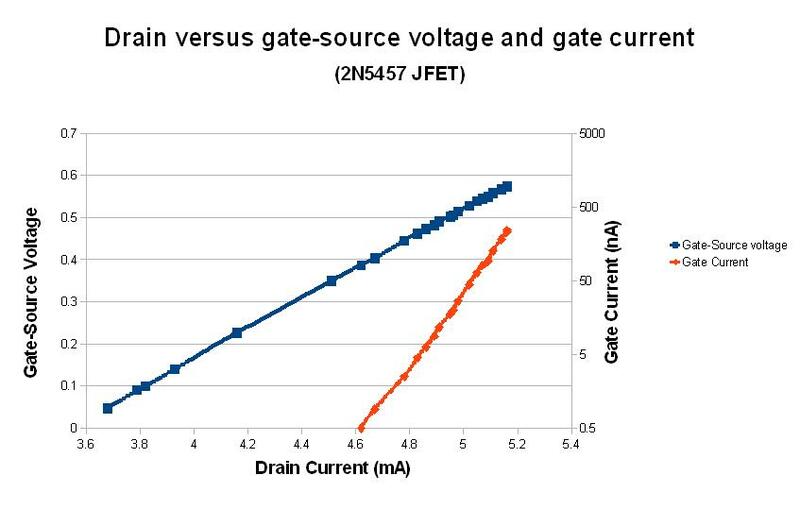 Gate current versus drain current for a typical JFET using measured values in a test fixture. As can be seen in figure 3 the current increases exponentially with gate-source voltage in a "diode-like" manner. Like bipolar transistor, the drain current (akin to collector current) increases with gate current (akin to base current), but it's in linear proportion to the gate voltage rather than the gate current! This feature is due to the fact that the "gate-source" junction is conducting and is doing so in a classic "diode-like" manner. For our purposes the JFET operates in this mode in a manner much more "quietly" than a bipolar transistor would if we were to simply drop one in its place in this circuit, mainly due to the fact that noise currents are a small portion of the FET's overall drain current whereas they would be comparatively large in the case of a bipolar tranasistor. Although this graph doesn't extend far enough, this "semi bipolar-like" property of JFETs is exhibited only for very low gate currents as the FET itself is "mostly" saturated at the point that a significant amount of gate current (e.g. gate current >> gate-source leakage current) begins to flow and there is a limit as to how much drain current will flow and still exhibit any resemblance to the curve above! Under low-light conditions, the operational and leakage currents of the APD aren't enough to "saturate" the JFET and it continues to operate "normally" - even with a high (>100 volt) bias on the APD. If operated under conditions with higher ambient (or incident) light, the bias voltage should be reduced as much as necessary and R202 will provide ample protection to the APD and FET to prevent either from being damaged. It should be remembered that if there is plenty of "extra" light, the extremely high sensitivity of an APD-based isn't going to be required, anyway and one might be better off using a different (and less-sensitive) detector! One of the trickier aspects of this circuit is finding the best operating current at which Q201 should be biased. Because there is actually gate-source current flowing in Q201, it is "turned on" very heavily and it will sustain quite a bit of current - typically 20-30 milliamps for the rather "substantial" BF862 JFET specified here. In the source lead of Q201 is R203, a 10 ohm resistor that may be used to monitor the drain current at a ratio of 10 millivolts of drop per milliamp. Once the proper device current has been found it is suggested that this resistor be jumpered (JP201) to take it and its voltage drop and possible noise contributions completely out of the circuit. For truly optimal performance one would experiment with the value of the current-setting resistor R205 and find the value that increased the current just to the point where the sensitivity of the receiver - as tested in a dark room "photon range" using very weak test signals - started to decrease, and then back off a bit (say 10-20%) from there to assure that the current would stay within the proper range over a wide variety of operating temperature and supply voltages. However, it is rather safe to run Q201 with a "lower than optimal" current and have only a slight decrease in ultimate sensitivity - and it is much easier to do this than running a lot of dark-room tests! The 120 ohm value shown here for R205 should be quite safe when using a BF862 FET which is both fairly well characterized compared to many FETs and is generally capable of far more current than Q202 and Q203 will source. If one substitutes a different transistor for the JFET, Q201, adjustment of R205 will likely be necessary. The 2N5457 is a good substitute and it may work well with the 120 ohm value specified for R205 - depending on the individual device, but keep in mind that individual devices can vary. If using a poorly-characterized device like the MPF102 - which can have drain currents all over the map - it will likely be necessary to try different values of R205 and/or a number of different devices to find the one that works best. When the BF862 is used with the values noted in the diagram, it should be noted that the drain voltage will be very low - possibly well under a volt. 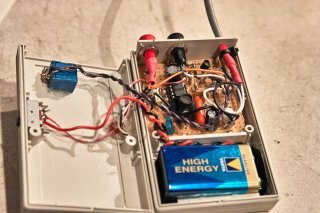 In the two prototype receivers, the drain current worked out to be around 7-8 milliamps (to moderate current consumption and improve battery life) and the drain voltage was on the order of 0.21 volts with an APD bias of 12 volts and about 0.155 volts with an APD bias of 135 volts - the point at which the APD was beginning to break down and its gain (and noise floor!) was the highest - both of these readings taken with the APD in complete darkness. Compared to a garden-veriety JFET such as the MPF102, the BF862 has quite low "on" resistance so it will exhibit a significantly lower drain-source voltage drop than many other JFETs when turned fully "on" as would be approximately the case with this circuit during normal operation. It is important to remember that it is the variations in current that the cascode circuit sees rather than voltage so a fairly low voltage can be expected and still have the circuit work properly. It is also important to be reminded that because it's the drain current that is changing with applied light, you will not easily see signals if you were to put an oscilloscope probe on the drain of Q203! Finally, it should be noted that because the APD itself does have gain, eking every last dB of performance out of FET Q201 is arguably less important here than it is on the "Version 3" PIN-diode based optical receiver as it is more the noise contribution of the APD than the FET that is likely to determine the receiver's ultimate weak-signal performance. Isolation of the high voltage generator. Because it uses a high voltage boost circuit, it is important that both the electric and magnetic fields produced by this circuit be kept away from the receiver. Were they co-located within the same enclosure, it would likely be very difficult to keep it out of the extremely sensitive optical front end. Mechanical and practical reasons. By having the optical detector separated, connected only by a single cable, the size and weight of what is to be mounted on the back end of the optical enclosure is reduced. This also means that if adjustments are to be made to the bias voltage - or if the battery is to be replaced - this may be done on using the box containing the high voltage supply rather than having to touch the optical front end which may be very mounted to a lens assembly that is delicately pointed and easily disturbed if touched! As shown in the pictures, the optical front end is constructed inside a box made from double-sided glass-epoxy circuit board material. In all cases, both surfaces of this material are connected together and to the receiver's ground to provide good shielding and EMI/RFI protection. Because I had them available, I used solder-in feedthrough capacitors for both the low and high voltage inputs as well as the baseband audio output and a BNC connector was used for the "Flat" audio output. If feedthrough capacitors are not available, put a 0.001-0.01 uF capacitor at the point where each wire enters the enclosure. This circuit was tested in broad daylight over an optical path of about 21km (13 miles) and it was found to work reasonable well. Because it was daylight the diode was saturated, requiring that the bias voltage set to minimum. Even at that, the recovered audio was somewhat distorted due to the diode and/or JFET operating in a nonlinear range, but this could have been mitigated had optical attenuation been applied to reduce the overall light levels reaching the APD. See the page Daylight Optical Testing for a few more details about this experiment. As noted above, if either low (<200 Hz) or high (>6 kHz such as for subcarriers) operation is intended, use the "Flat" output for best results. When an APD is operated near its maximum gain, care must be taken to assure that the bias voltage is compensated with device temperature to assure that the device gain is consistent over the expected range. Since this receiver would normally be operated so that the diode at far less than maximum gain, and since we are also not really concerned with absolute gain levels (we are just detecting audio!) this aspect is of no real importance. The bias supply is adjusted (using R109) so that the maximum voltage that may be applied to the APD is on the order of 140 volts, but because if the limited-current nature of the supply and the presence of R202, a series current-limiting resistor, the APD cannot be damaged by the application of excess voltage. 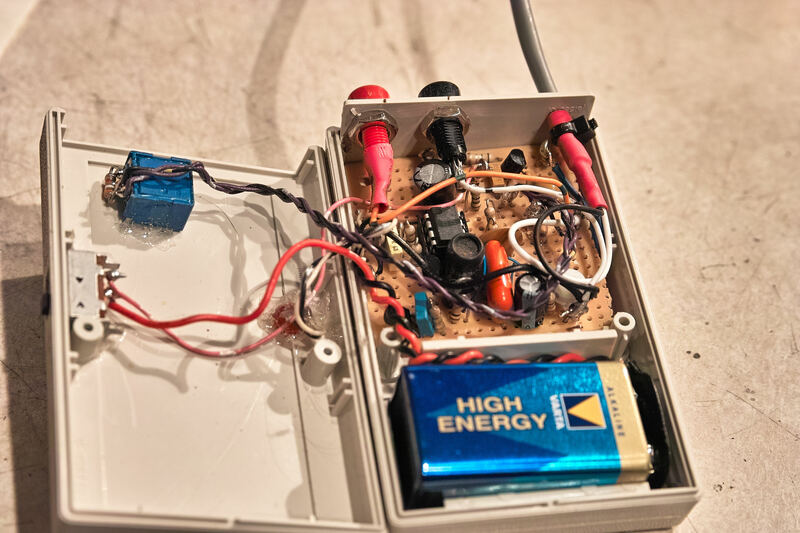 As noted above, in testing the APD receiver was operated at maximum bias voltage (about 140 volts) and a photoflash was repeatedly set off inches away from the APD in otherwise total darkness. No damage to either the APD or the input JFET (Q201) was observed, this being a worst-case scenario for abuse! The BF862 is available only in surface-mount format, a fact that slightly complicates the mounting of the device. No matter which JFET is used it is important that one NOT mount the anode lead of the APD or the gate terminal of the JFET on circuit board material as this will cause a degree of leakage - particularly important with the high voltages involved - plus the fact that any circuit board trace will increase both the capacitance and the surface area of a conductor that might pick up noise. The circuit shown in Figure 2 depicts the APD to gate connection being made in the air with the body of the APD being grounded and some of the other components being mechanically stabilized using clear epoxy with care taken to avoid getting that epoxy near the gate/APD lead. After it was constructed and the epoxy cured, any stray bits were scraped away and then the APD and JFET carefully cleaned of solder flux, oils and other contaminants with denatured alcohol. The operating current of the entire APD receiver and bias supply is less than 35 milliamps which means that it will last for well over 10 hours on a fresh 9 volt alkaline battery. but it is strongly recommended that one always brings at least two fresh batteries for spares! Top: The APD bias supply - which also contains the battery that powers the front end. Center: The rear side of the APD optical front end showing the cover shield. On the right edge one can see the white audio cable carrying baseband, the gray cable that carries both the low and high voltage and a glimpse of the BNC connector for the "Flat" output. 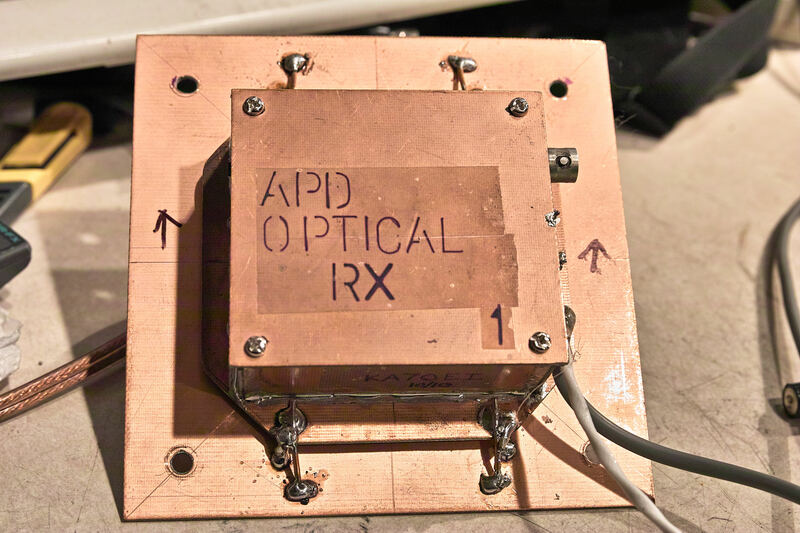 The wires visible above and below the box are used to hold it in rough paraxial alignment and focus during initial setup with the "fine" adjustments being made to the small board that holds the APD and JFET. Bottom: The "photodiode end" of the APD optical receiver. The black ring is used to provide optical alignment when installed in the lens box. Before turning on the APD receiver it is always a good idea to first turn the voltage down to minimum, mostly to avoid being blasted by noise. As noted above, the LED is not only useful as a power indicator, but because it is also modulated with the 6.5 kHz switching tone from the voltage converter it may be used as a convenient optical test signal for this and other optical receivers. As noted above, with little or no bias voltage, the performance of the APD - operating as just an ordinary photodiode - is comparable to any other photodiode. For narrowband speech operation, it has been determined that fairly low bias (around 45 volts) is appropriate for the best, low-signal performance under dark conditions and in this voltage range, the amplification factor, "M", of the APD is quite modest (a signal voltage in the range of 10-30). In this range there is enough amplification provided by the APD itself to overcome the noise floor of Q201, the JFET, and an improvement of 6-10dB is observed when compared with a standard photodiode receiver. At higher voltages (>45 volts) the gain continues to increase, but the noise generated by the APD itself increases even faster! As the voltage continues to go up the detected signal continues to increase in amplitude, but a weak one may soon overtaken by APD's own noise and may be lost altogether! Different APDs have different voltage/gain curves, but in general, the best S/N for low-frequency (audio range) operation occurs in the range where "M", the amplification factor, is in the range of 10 to 30, regardless of the actual bias voltage. As the bias voltage is increased, the usable bandwidth of the receiver also increases, both owing to continued reduction in the APD's device capacitance, but also due to the APD's intrinsic gain boosting the higher-frequency components (and noise!) above the noise floor of the amplifier circuitry as well as increasing "gate-source diode" currents of the JFET causing its apparent impedance to drop and increasingly quash the effects of JFET gate and APD capacitance.. As you have probably already guessed, there is a tradeoff between bandwidth and sensitivity here! As with the V3 receiver, very high levels of light (ambient or from the distant optical transmitter) also affect the frequency response owing to the fact that the APD's photoconduction and the JFET gate current will shunt the capacitance and raise the "knee" frequency of the R/C-caused lowpass filtering. Continued increases in the bias voltage turn what was a weak background hiss into a loud roar as the APD's internal noise generation becomes dominant. For the APDs that I used, their maximum gain occurs just below their maximum voltage rating which, for these devices, is around 135 volts. As noted previously, the last several volts yield very rapid and dramatic increases in both gain and device noise, making adjustments of the bias voltage control rather tricky! When decreasing the voltage rapidly the receiver may momentarily go dead - particularly under very low light conditions. What is happening is that with a decreasing bias voltage, the charge on the Q201's gate goes negative, turning it off. Once the bias voltage stops changing, the minute leakage currents across the APD gradually bleed off the capacitance of the APD and FET, turning the JFET back on and restoring operation - a process that can take several seconds. This particular phenomenon is normal, expected, and there is really nothing that can be done about it that wouldn't degrade the receiver's operation! It should be stated once again that the goal was to produce a highly-sensitive radiometric optical detector that was optimized for speech range (up to about 3 kHz) frequency response. Additionally, being self-funded hobbyists, there was the additional goal that such a detector be built - as much as possible - using inexpensive, readily available, off-the-shelf components and construction techniques that were well with the capabilities of the advanced electronic hobbyist: With the designs outlined above, we believe that we have largely achieved that goal. If, on the other hand, the goal is to achieve optimal weak-signal detection capabilities at very low (sub-speech) frequencies or higher bandwidths (above speech, including the use of high-speed data, video, or multiple carriers) then careful consideration is warranted when deciding whether or not the methods outlined elsewhere on this page are entirely appropriate. At the time of original design the use of an APD offered an apparent 6-10dB improvement in sensitivity at baseband (audio) frequencies was noted on the "photon range" (an indoor, darkened room where signal levels from an LED driven at low current can be used to analyze receiver performance) when compared with a typical, similar-sized PIN photodiode. When an A/B comparison was done in the field on the "dark" end of a 150+ km optical path, this same degree of improvement was also noted - although variations in signal levels owing to atmospheric conditions, etc. tend to make precise numbers more difficult to nail down. During these same field tests it was observed that, in fact, best overall sensitivity was noted with the APD bias set in the 45 volt range as had been noted on the photon range. One question that is yet to be answered about the performance of the APD optical receiver is that of usable bandwidth. With the PIN Photodiode receiver, the primary factory limiting sensitivity at higher frequencies (e.g. >2 kHz and up) was that of the capacitance of the photodiode itself. To a degree, a smaller-area photodiode could be used but much smaller than 1 mm2 makes both mechanical alignment (e.g. focus and paraxial) more critical and too much smaller than this one starts to approach the limit imposed by the size of the "blur circle" of the Fresnel lens. (For a discussion on "blur circle" size for typical Fresnel lenses, see the page Fresenel Lens Comparison at this web site. Because of its intrinsic self-amplification, an APD should be able to provide even better higher-frequency performance than a similarly-sized PIN photodiode as the self-amplification will overcome the noise floor of the amplifier itself to a degree, plus the higher reverse voltage will also do more to further-reduce the device's capacitance. As noted, however, an "A/B" comparison of similar-sized APD and PIN devices has not been carried out at ultrasonic and higher frequencies. Receivers for low-bandwidth optical (through-the-air) communications - This page talks about a variety of different optical receiver topologies for low-bandwidth (primarily baseband) operation. A Highly-Sensitive receiver optimized for speech bandwidth - One of the receivers mentioned in the above page is described in greater detail. It is this receiver from which the one on this page has been adapted. Fresnel Lens Comparison - On this page one may find a discussion and comparison of the optical qualities of various molded, plastic Fresnel lenses. In particular, note the size of the "blur circle" of such a lens when it is used for receiving a distant signal with respect to the size of the detector's active area. A Low Noise PIN Diode Laser Receiver - Part 1 and Part 2 Note that some of these pages may not render properly on some browsers. "Modulated Light DX Receiver Circuitry" on the Modulated Light DX page. These pages contain a wealth of information on related topics. F1AVY's pages - Yves describes many aspects of detection (and methods of using lasers to generate signals.) Please note: The hosting web site of Yves' pages has changed and most of the pages at the new site are in French - click here for a Google translation of the main page into English. Photodiode Receiver in French (Google translation to English) - This page provides additional insight to the operation of the "K3PGP" type of receiver. Photodiode Front Ends: The Real Story - This is an article by P.C.D. Hobbs that describes several techniques to maximize bandwidth of a photodiode receiver. For an application using this type of circuit, see the page LED AM Video link on this site. Optical Receiver Operation With High Internal Gain of GaP and GaAsP/GaP Light-emitting diodes - This article describes using common LEDs as reverse-biased optical detectors exhibiting gain in a manner similar to that of an APD. Design of Wireless Communications Link using Transreceiver System - This article describes one possible approach in implementing high-speed optical data links using various types of detectors - including APDs. Photodiode Amplifiers - Changing Light to Electricity (archived in 2006) - From National Semiconductor, an online seminar about various aspects of using photodiodes and how to amplify their output. This page links not only to some .PDFs of slides and transcripts of the seminar, but it also has an online video of the original presentation. Related to this topic is National Semiconductor's application note AN-1244 (from the Texas Instruments site) which also contains information about this same topic. The Technical Notes page. This page describes the general theory behind the operation of many types of optical devices, such as photodiodes, photomultiplier tubes, and many more devices. The Application Notes page. This page has a number of articles describing how optical devices are used in the real world. Return to the KA7OEI Optical communications Index page. If you have questions or comments concerning the contents of this page, feel free to contact me using the information at this URL.